LinkedIn is one of the most ideal social platforms for professionals from all industries. They all put efforts on this channel to promote their business interests. But, like any other online platform, LinkedIn has its share of security concerns. Since you share crucial personal and business information with others on the channel, first make it certain that the information is entirely private and no undesirable person or party has its access. This is your crucial first step before you start using LinkedIn for marketing of your products or services. In a bid to help you get rid of all security concerns, LinkedIn provide more than 40 security setting. But not all security settings match with your specific security and privacy requirements. Here we present to you 5 must-know security tips that you must follow when marketing on LinkedIn. But before you take the plunge and get started with your security setting, it is important to understand that visual appeal of your social media page design is something that your users notice first. So, it makes sense to invest in a professional, creative and fully functional social media page, even before you get ready to make your account secure. 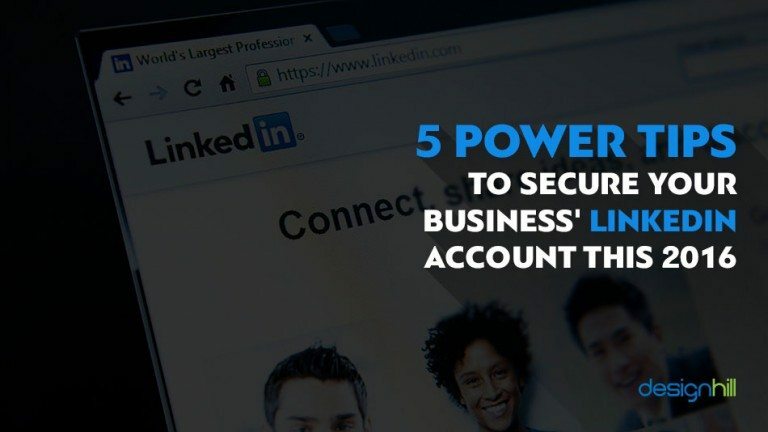 Now, without further ado, let’s discuss the security tips that can help you secure your LinkedIn account and make it easy for you to market your business on LinkedIn without any worries or hassles. 1. Turn Off Mentioned in the News – Turn off LinkedIn’s ‘Mentioned in the News’ feature if you have been dealing with reputation management issues. ‘Mentioned in the News’ is an automated feature that searches articles or content that mentions your name and presents it to you. Smallbiztrends.com says this feature is especially helpful for those concerned with reputation management. Remember, there’s no way to take care of what getting shared through LinkedIn’s ‘Mentioned in the News’ feature. And it’s best to turn news mentions off. ‘Mentioned in the News’ is a default button and you need to manually turn it off. 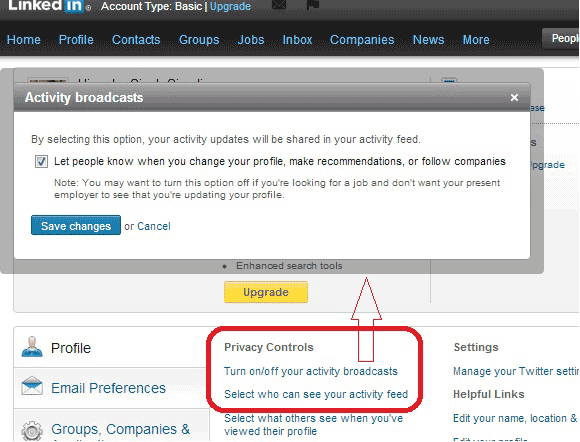 To do so, go to Privacy Controls and click Turn On/Off Your News Mention Broadcasts. In the pop-up that appears, click and uncheck the ‘Yes! Let Them Know’ box and then, ‘Save Changes’. 2. Turn off Share Profile Edits – Share Profile Edits feature is a privacy setting. This setting allows your contacts to view your profile activities. 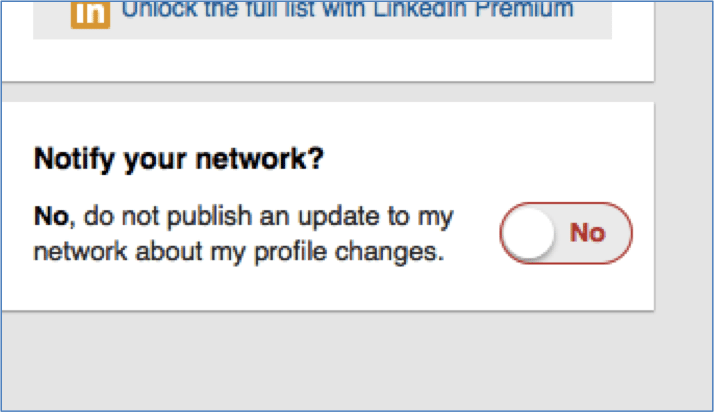 So, your network is notified whenever you make any changes to your profile. An article published at Forbes suggests you to turn Share Profile Edits off for you don’t really want your network to be notified of every little change that you make your account. Turn this feature on whenever you have a big news or an announcement like you’ve launched a product, some new has joined your team or you’ve added something significant to your LinkedIn company page. Once you spread the news, turn it off again. To turn the notification off, click on ‘Choose Whether or Not to Share Your Profile Edits’. In the pop-up that appears, uncheck the box (it’s checked by default) and then click ‘Save Changes’. Alternatively, you may click on ‘No’ on the right side of your profile under Notify Your Network? 3. Control Who Can See Your Activity Feed – You wouldn’t always want your users to see what are you doing on LinkedIn. For example, you wouldn’t want your connections to know what companies you follow or what groups have you joined. Remember, this is visible to your connections by default. That’s why Interoadvisory.com says that it’s essential to keep your activity feed private. To change it, go to profile settings and click on ‘Select Who Can See Your Activity Feed’. In the pop-up that appears, choose the ‘Only You’ option and click on ‘Save Changes’. And you’re done! Now, you can keep your activities private on LinkedIn. 4. Control What People Can See – It has become a common practice to companies to view the profile of LinkedIn member, especially when they are hiring. But there are times when you don’t want LinkedIn members to know if you’ve viewed their profiles. This is where LinkedIn provides a feature to be make yourself completely private. CIO reveals that this feature specially comes in handy when you wish to check out what your competitors are doing on LinkedIn. 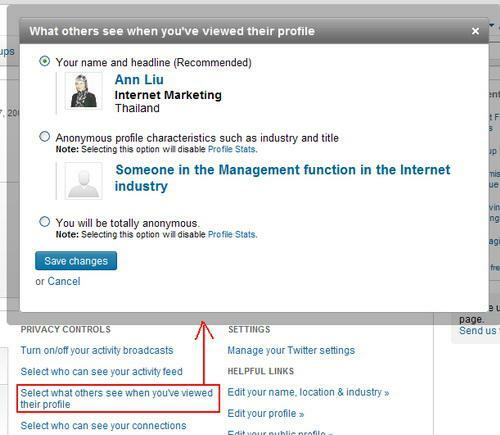 To control what people can see on your profile, simply click on ‘What Others See When You’ve Viewed Their Profile’. Then choose if you wish to go semi private or completely private. In the semi-private mode, people can just your name and headline and in the completely private mode, people may see no information. But remember, as soon as you choose to go private, the history will get deleted. 5. 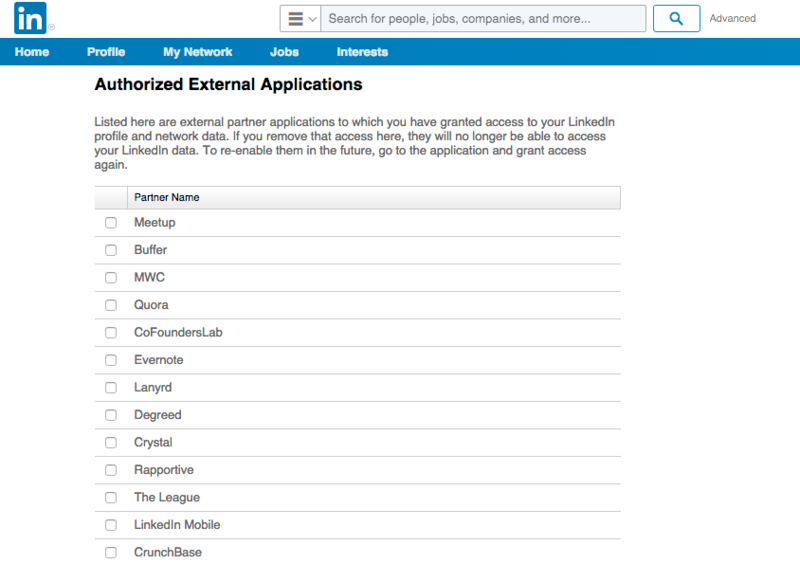 Turn Off Third Party Apps – It makes sense to check which third applications have access to your LinkedIn profile and network data. Remove apps that aren’t useful for your business. In order to remove useless apps, go to the ‘Groups, Companies & Applications’ tab and then click on ‘View your Applications’. Then, simply remove apps that you‘re no longer using. It also makes sense to turn off data sharing with third-party applications. To do so, go to the ‘Groups, Companies & Applications’ tab. 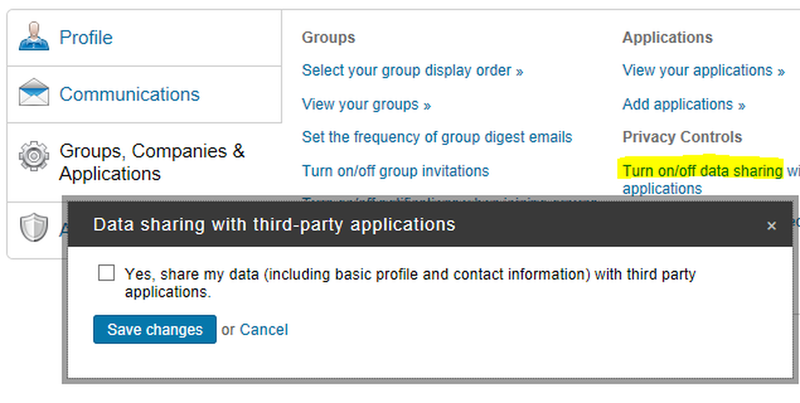 Then, click ‘Turn On/Off Data Sharing With Third Party Applications’ and in the pop-up that appears uncheck ‘Yes, share my data (including basic profile and contact information) with third party applications. These few crucial security and privacy settings are your helpful tips when you want to meet most of the vital aspects of security while seeking LinkedIn marketing solutions. As always, please share your thoughts in the comments, if you enjoyed this post share it on twitter, and never hesitate to hit us up with any questions, critiques, or feedback.